Felicianation Ink: Lady Gaga: Artist or Gimmick? Lady Gaga: Artist or Gimmick? The very first time I saw Lady Gaga, I was just tuning in to something that was already in progress. The camera was very far from the stage, and all I could see was blond hair. I thought at first that it might be Christina Aguilera. but being a singer alone does not a true artist make. The next time I saw her, she was wearing a hugely outlandish costume, and it was completely unflattering; she started to remind me of a cross between Marilyn Manson and Madonna, and I was less than impressed. It felt like a gimmick to me, not true creative expression. She didn't have her own identity, she'd taken over two others. Apparently, I wasn't the only one who saw the resemblance, I found this photo and many others by putting their two names together in Google. Her first hit that I really knew about was Poker Face, and while the tune was catchy and the lyrics OK, it felt like another "flash in the pan" dance remix that makes a lot of money but makes no difference in the long run of the history of music. My point is I didn't really feel like Poker Face was exactly going to become a classic, to be played on golden 00's in 30 years, you know? Not exactly Hotel California material. Just sayin'. Although we are still occasionally reminded of NKOTB, so what do I know about staying power? As time goes by though, I gain more and more respect for her. Her music is mostly very good, especially when you strip away that "boom boom" dance club remix it seems songs need nowadays to be a hit. *What ever happened to the value of great lyrics? Case in point: Chris de Burgh, a true lyricist wrote such beautiful words as "For it's a different world when I look into your eyes, it's the closest thing I have seen to paradise, and I know that with you I will be in love forever". Now those kinds of lyrics can stand on their own. So maybe she's not just a "flash in the pan" after all. I think she truly is an artist. Tortured and insecure, and the gimmick was just her way of being known. Now I think it's just fun and too late to turn back. One thing I'll never understand though, why do the costumes always have to make her so dang ugly??? 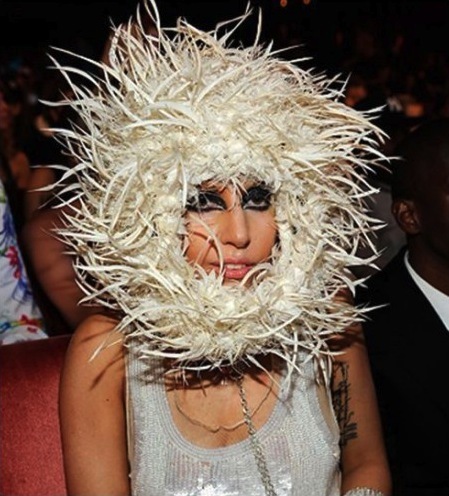 Sometimes I wonder if it's insecurity that leads her to want to hide herself, as we saw in her Monster Ball movie. I'll leave you with a link to the video of "You and I", so that you can have it stuck in your head too, isn't that nice of me? ;) Plus, more crazy costumes. I do find she looks beautiful when they show her au naturel though. lol.. who knows? stranger things have happened!